The Victory Compact 8x20 fits into a shirt or jacket pocket and it delivers breathtaking views. 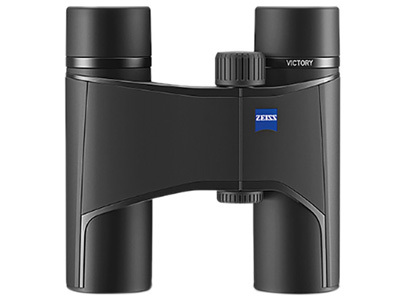 Building on the success of the 20mm version, the larger-objective ZEISS 8x25 Victory Pocket Binocular is engineered with improved performance — including a wider field of view and exit pupil, with a longer eye-relief, to boost its overall performance and handling. Complementing these improvements is a moderate magnification that brings subjects in-close without the associated visible hand-shake common in higher-power optics to provide users with an immersive observational experience. This larger-objective model maintains the optical technology of earlier iterations to ensure the overall visual performance users have come to expect from ZEISS. The optical path features phase-corrected Schmidt-Pechan roof prisms with dielectric mirror coatings. These prisms maximize acuity and light throughput while eliminating aberrations and distortion. The lenses are fully multi-coated with ZEISS' iconic T* anti-reflective multi-coatings and their LotuTec protective coating. T* multi-coatings increase light transmission while eliminating lens-flare and glare, while improving colour rendition, clarity, and contrast. The LotuTec coating helps maintain the integrity of each external lens surface by repelling liquids and debris for a clear view in any conditions, weather, or situation. The Victory's housing is made of a lightweight and strong magnesium alloy, wrapped in a protective rubber armour that provides a slip-resistant grip. Its optical tubes are nitrogen-filled and O-ring sealed to deliver waterproof performance, while resisting internal fogging when moving through extreme temperature or environmental conditions. The distinctive offset hinge design provides a visibly unique and compact form-factor that is easy to adjust and use one-handed. Interpupillary Adjustment	34.0 - 74.0 mm / 1.3 - 2.9"
Box Dimensions (LxWxH) 11.4 x 7.2 x 3.4"